​well-maintained and will display a donor recognition tag for all of 2019. YOUR BIRDHOUSE IS JUST A FEW CLICKS AWAY! Just click the link below to download & print The 2019 Birdhouse Sponsor form! ​IS JUST A FEW CLICKS AWAY! ​PREFER TO PAY BY PERSONAL CHECK? Just click the link below to download & print The 2019 Birdhouse Sponsor form. You can read the full Autumn 2017 Forest Notes magazine online via their website. The Bates article begins on page 29. 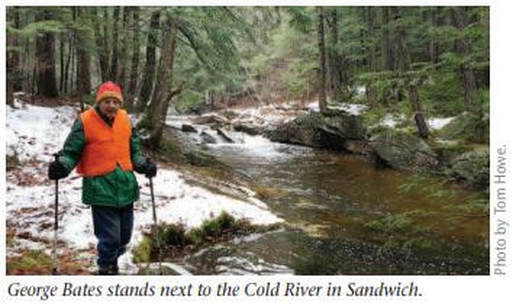 No matter how long and scenic a trail may be in Sandwich, N.H., cross-country skiing enthusiast George Bates is always, always going to think it needs to be two more things: longer and protected into perpetuity. 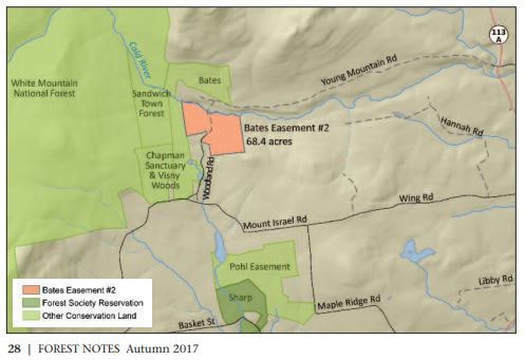 The new easement on 68 acres protects a forest that is within a focus area of the Forest Society’s Lakes Region Conservation Plan. It boasts the county’s champion Bigtooth Aspen, according to the N.H. Big Tree Program, plus large hemlock, yellow birch and ash trees that have gained their distinctive girth thanks to growing on steep slopes not amenable to harvesting. The picturesque trails follow the excellent trout habitat of the Cold River. Most importantly to Bates, the piece connects to thousands of acres of conserved land, extending the block of protection to the east of the White Mountain National Forest.